Join MCA Santa Barbara for its fourth annual 24-hour drawing marathon. For only $5 (FREE for MCA Santa Barbara members with membership card), you can observe professional and amateur artists, youth and adults, drawing and making art side-by-side. Artists must register by June 14 (all ages welcome, space is limited). Priority registration for MCA Santa Barbara members. To register or for more information, visit mcasantabarbara.org, email jalford@mcasantabarbara.org, or call 805.966.5373 x101. All drawings made will be sold to the public at one of four affordable prices: $25, $75, $150, and $300, plus tax, and proceeds are divided among the drawers and MCA Santa Barbara. Drawing is broadly interpreted and works by artists of all disciplines, skill levels, and ages grace the walls throughout the 24-hour event. Attendees are encouraged to return to see it all unfold and secure that one-of-a-kind artwork. Special artists include: Phoebe Brunner, Ann Diener, Dane Goodman, Penelope Gottlieb, Saul Gray-Hildenbrand, Kimberly Hahn, Hugh Margerum, Ethan Turpin, and James Van Arsdale. CLASSES Collaborative and interactive drawing opportunities allow attendees a chance to participate in the fun and a live video feed allows remote viewers to watch artists' progress. 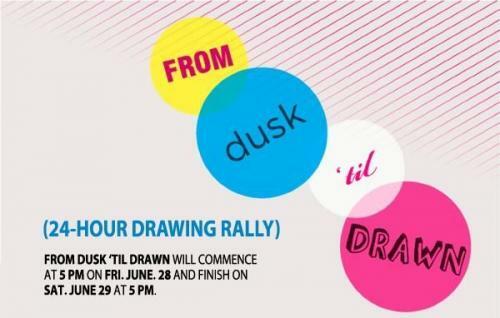 Visit http://mcasantabarbara.org/event/dusk-til-drawn for the link on Friday, June 14. Special thanks to the following Santa Barbara companies: Art Essentials, Art From Scrap, Ben & Jerry’s, Frame, The Purple Crayon, Paseo Nuevo Shopping Center, and SAVOY Cafe & Deli. Celebrate the artists efforts and enjoy a beverage while perusing the final works. FREE to attend and purchase remaining artworks.